So after putting all the names into a hat (literally), Cafe Fashionista and Free TEYme are the 2 winners from the drawing. Please e-mail me an address to sent your new City Chic book. Have fun reading! I love to window shop and people watch because I can draw inspirations from people and things around me. 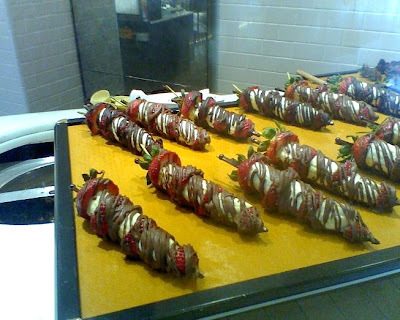 Of course, how can a gal walk by Godiva and not be tempted by one of these strawberry kabobs..... I think I drooled on the window! So it's always very different looking a runway picture vs. real life. I think these 2 tone hosiery are quite interesting but I on the fence about them still though. Besides layering them with a short skirt or dress, I don't know what else to wear with these without looking funny. I don't think I will wear these with a Chanel suit going to a meeting. 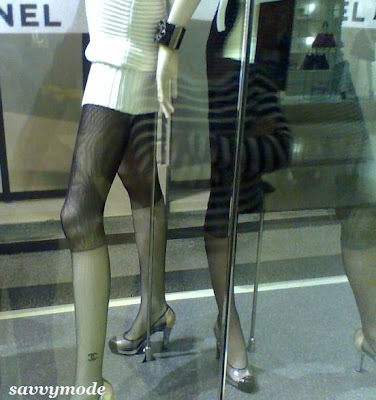 The 2 tone hosiery is fun but is it for me? To be honest, I will not be one bit surprised if these are hot sellers. 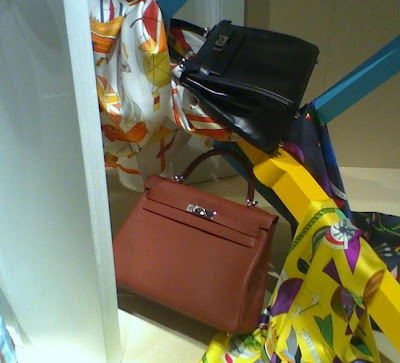 Lastly, the economy must not be doing that well because when do Hermes Kelly bags become window displays. Back in the days, I had to practically beg my SA to sell me a black or cognac color Kelly. Now, both in the same display, what is going on? In case anyone is interested, the black is 28 cm in smooth box calf and the cognac is 32 cm in Togo, I think. There is also a 28 cm fuchsia ostrich HAC in the store as well for $16,000. my mouth is watering from those strawberry kabobs and those Hermes Kelly bags of course! Congrats to the winners and those chocolate covered strawberry kabobs look delicious! Those look sooooo delicious. And the Hermes bags are fantastic! I love the pink tulips on your blog....I enjoyed reading your blog today. I am still new to the land of blog, but so loving reading others stories. i MUST try/make those strawberry things!! to die for!! and thank you for your thoughts last week. colin's doing great just extremely sore! Chanel photo is really good! :) Is that a tights with cc print? Love the bags from the last photo! So classy! By the way, could those strawberry kabobs look any more scrummy? I'm dying to try one! I am so in love with everything that you posted....looks like someone was at South Coast this weekend!! !